If you've read any of my previous posts on branding, you know I like to use a brand questionnaire at the beginning of each project. The document itself is not very long, but it can take some time for clients to think through all of the questions. This is by design. While I love talking to my clients about their brand, I want to make sure they have a chance to reflect on their own vision and identity. Learning about a company's brand through their own words helps me ensure that the final product aligns with their goals and creates a stronger brand presence. The questionnaire includes a range of questions from the very basic--company name and target audience--to the more abstract--unique traits and descriptive words. 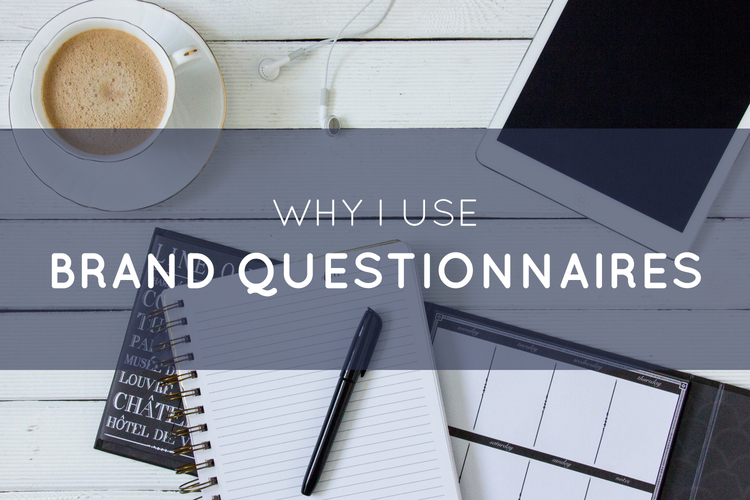 Each question is designed not only to help me understand the client's business, vision, and goals, but also to ensure the client does as well. Sometimes, in the excitement of starting a company or rebranding an existing organization, people forget to think through their own corporate identity. It's always a delight to see someone discovering elements of their brand for the first time. This is a basic question that helps me identify what excites the client. Often, they have noticed a need that wasn't being fulfilled by other companies or wanted to transition a passion or hobby into a profession. This question can be tough, especially for those clients that are just a little hard on themselves. I always remind people that they are what makes their business unique. For example, there are a lot of photographers out there, but maybe my client is unique because they're skilled at making people laugh and enjoy themselves during a shoot. Another example might be an accountant who is great at breaking down complex ideas into simple explanations that put their clients at ease. Who are your main competitors? What do they do well and what can they do better? I ask this question to make sure my clients realize their company doesn't exist in a vacuum. They have to know who else is out there doing what they do. This also helps them find what differentiates them from the competition. While I always conduct my own competitive research, no one knows their own products and services better than the clients themselves. The purpose of this question is to help my clients keep their customers in mind. Many people have never thought through the details of whether their audience is individuals or companies, corporations or small businesses, millennials or older generations. While this information is important when creating the look and feel of a brand, it also impacts details like accessibility and readability. I had one client who was trying to reach seniors, but who had originally selected tiny fonts that were too difficult for older users to read. Font size is just one of the many decisions that must be made with a specific audience in mind. If your brand were a person, give 5 key words that would describe them? I think this might be my favorite question. A brand presence is a living, changing idea, and clients need to be able to articulate its personality. Some brands may be quirky, vivacious, and bright, while others are approachable, calming, and supportive. There are no wrong answers! The brand questionnaire is the start of an ongoing conversation. Once a client had a chance to answer the questions, I have the opportunity to ask follow-up questions and draw out further detail. I often refer back to the questionnaire throughout the branding process to gain inspiration and refocus when needed. I'd love to learn more about the inspiration and personality behind your brand! Use the Contact Us page to drop me a quick note. I'll be in touch to learn more!